What’s in a Colgate Eco Classica III Crib Mattress? What Can Be Used with the Colgate Eco Classica III Crib Mattress? What’s the Weight Capacity of the Colgate Eco Classica III Crib Mattress? Does Colgate Mattress Offer a Sleep Trial, Return Policy and Warranty? How Much Does the Colgate Eco Classica III Crib Mattress Cost? You might think of toothpaste when you think of Colgate, but don’t be misled. The Colgate Mattress Atlanta Corp is not only unaffiliated with the worldwide dental and oral care brand, but has also been around for over 60 years! Founded in 1955 by married couple Sol and Anne Wolkin, Colgate Mattress Atlanta Corp was and has remained a family affair. The company is currently run by the Wolkins’ children and grandchildren. With a noticeable focus on high quality sleep products for infants and toddlers—the company is known as “The Crib Mattress Specialist”, after all—it’s easy to see how the Colgate Eco Classica III came to be. But what is it about this product that makes it to popular? The Colgate Eco Classica III crib mattress remains a standout even among other similar offerings in the company’s product line. Read the review below to find out all about the Colgate Eco Classica III. 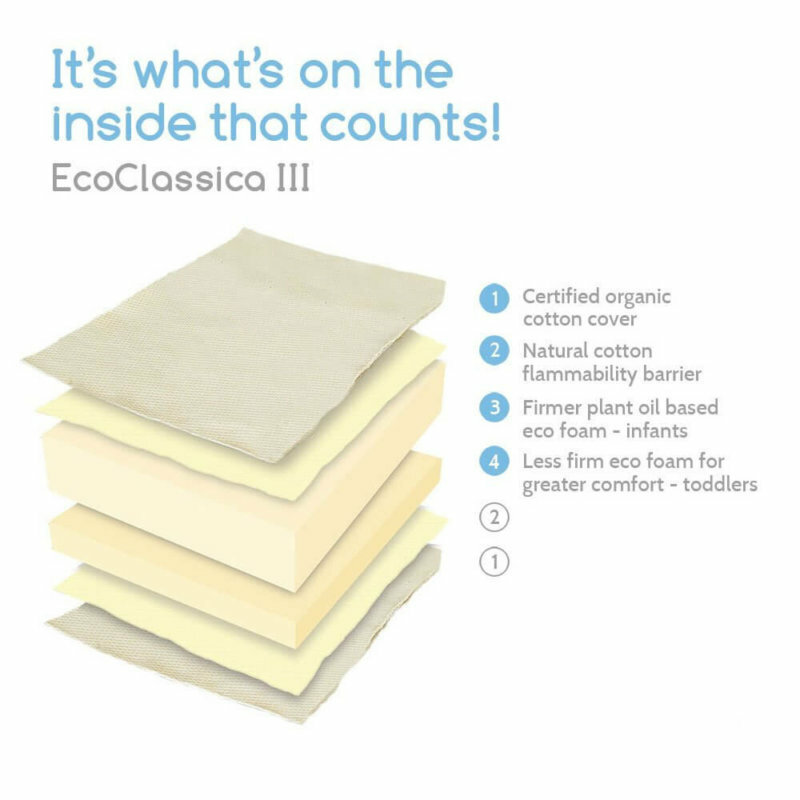 The Colgate Eco Classica III has all the typical marks of a good crib mattress. It carries both GREENGUARD Gold and CertiPUR-US certifications, and is compliant with the CPSIA (Consumer Product Safety Improvement Act of 2008), as well as state and federal flammability requirements. No fire retardant chemicals are used on the fire sock, only natural cotton fabric. Contrary to popular belief, the Colgate Eco Classica III isn’t marketed as an organic product! The company refers to it as an “eco-friendlier” crib mattress, apparently for transparency purposes. In the official website, Colgate Mattress notes that there is no industry-wide standard for what qualifies as a product that can be called natural or organic. It is meant to be used by your child from infancy to well into the toddler years. The two clearly marked sides are of different firmness levels for exactly this purpose: the extra firm side to better support infants, and the less firm flip side to provide more comfort to toddlers. The crib mattress contains two layers of what the company calls “eco-friendlier” foam—one extra firm and the other less so—said to be made with sustainable non-food plant oils. While we trust the certifications given to the Colgate Eco Classica III, we do have qualms about the vague description of its main component. Given that Colgate Mattress puts a premium on transparency, this is a little disconcerting. There are other mattress companies that are more upfront and provide more information on the eco-friendly materials used in their products. The non-specific language reminds us of another crib mattress: Moonlight Slumber Little Dreamer. It is similar to the Colgate Eco Classica III in that their foam is marketed as plant based. The tag on the crib mattress states that the entire product is 92% urethane foam. According to Colgate Mattress customer support, the foam is only about 20% plant oil-based, as a higher ratio could compromise the amount of support provided. We looked around online and found information on soybean oil-based polyurethane foam, which is likely what Colgate Mattress is talking about. 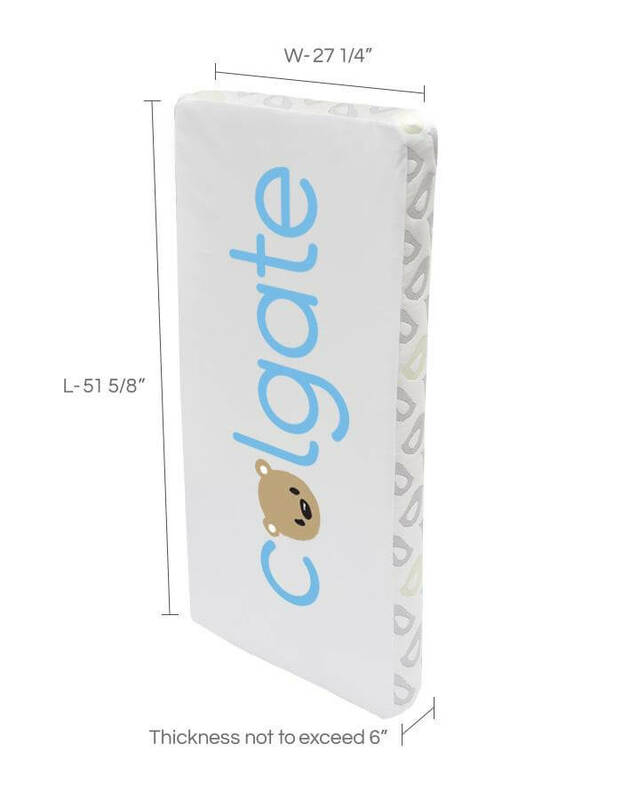 What Is the Colgate Eco Classica III Crib Mattress Cover Made From? The two foam layers are enclosed in a fire sock, and then sealed into a non-removable “certified organic” cotton cover with inverted seams. Again, there is some vagueness here. It is not clear where this organic cotton certification comes from! We looked for the certification logo Colgate Mattress used in their official website, and we couldn’t find a match anywhere online. This doesn’t mean that the certification is bogus—just that it’s not properly documented in their product details. The cotton cover is also waterproof-backed. This helps prevent unwanted bed bugs and dust mites from being anywhere near your child. Again, the materials used for this part aren’t specifically stated, although the company notes that it is food-grade and hypoallergenic. Can You Customize the Colgate Eco Classica III Crib Mattress? No. The Colgate Eco Classica III comes in only one color and only one size. The Colgate Eco Classica III is just one crib mattress out of dozens that Colgate Mattress has developed and made available commercially over the years. If you’re looking for another kind of mattress—gel memory foam, hybrid innerspring, etc.—chances are you’ll find it among the company’s other offerings. One great advantage of buying from Colgate Mattress is that they also make mattress pads, covers and other accessories. These are likely to all be compatible with the Colgate Eco Classica III or whichever mattress of theirs you end up picking. 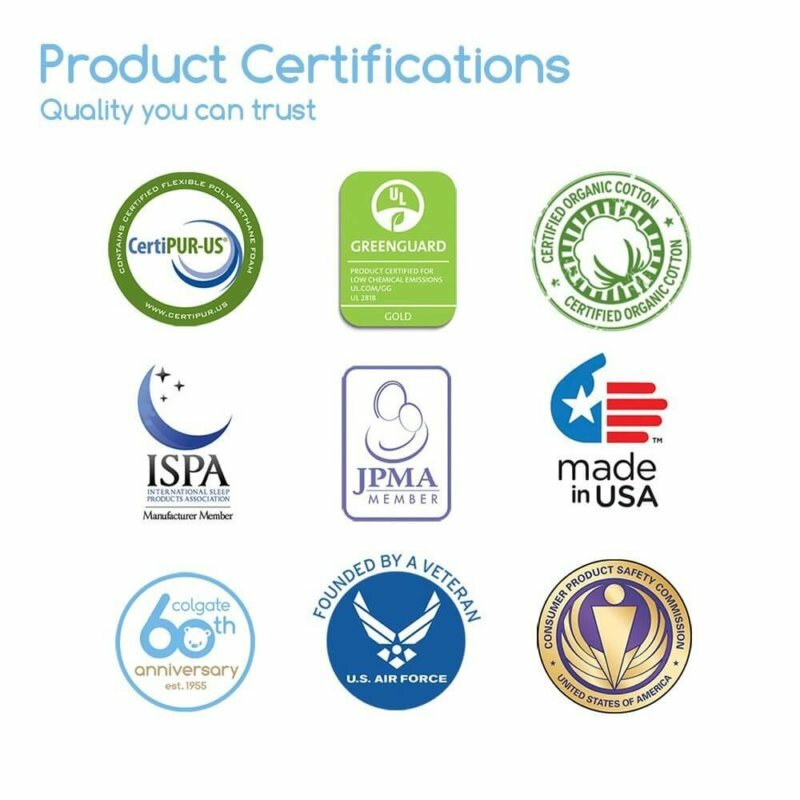 The size of crib mattresses is regulated by the Federal government by the CPSIA, of which the Colgate Eco Classica III is compliant. This means that any standard crib can be used with the Colgate Eco Classica III. it should fit snugly, especially with its square corners. If you’re not sure if your crib is standard, do perform the two finger test to check if there’s too much space between the mattress and the crib. Any more than the width of two fingers and your crib frame and mattress aren’t compatible! Change one of the two to avoid possible entrapment or suffocation. Some reviews online have also mentioned that the Colgate Eco Classica III doesn’t work with baby motion monitors, so keep that in mind. How Do You Set Up the Colgate Eco Classica III Crib Mattress? The crib mattress comes in simple, frustration-free packaging. No hard plastic, no brightly colored box, no triple- or quadruple-layered material covering the product. Just a plain brown box and the Colgate Eco Classica III wrapped in plastic that’s easy to take off. While we did have some questions about the make and design of this crib mattress, we’ve found no widely publicized reports or reviews of the product off-gassing or inciting allergic reactions. How Do You Clean the Colgate Eco Classica III Crib Mattress? 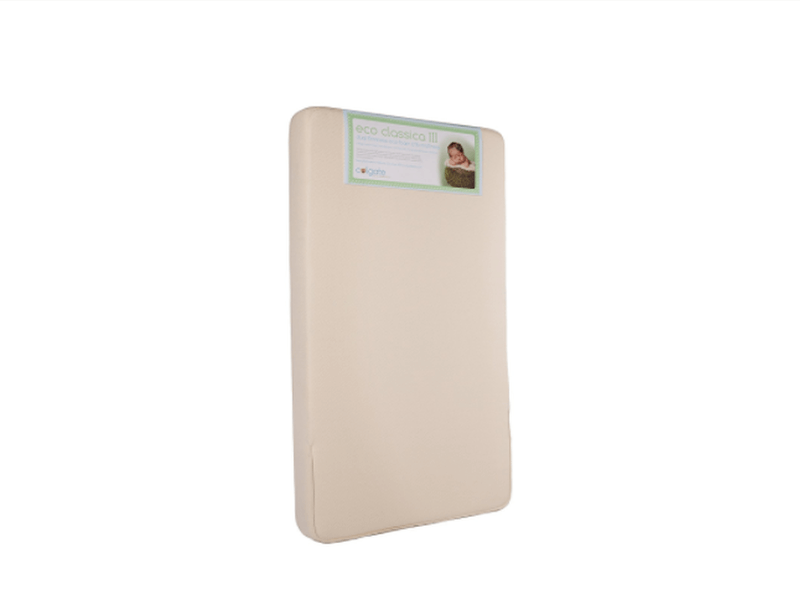 The Colgate Eco Classica III is also relatively lightweight at 13 pounds, which makes changing sheets a breeze. Because the mattress cover is non-removable—although waterproof—we do recommend that you use separate washable sheets or even an optional mattress pad, just to make life easier. Organic cotton, even with waterproof backing, does still stain! Spot cleaning will be much easier if you lessen the crib mattress’ contact with spills and accidents. Spot cleaning with a damp cloth and mild soap works, should you need to remove dirt or stains from the crib mattress itself. Make sure that it’s completely dry before you slip on new a mattress pad and sheets, though. There is no specific weight capacity listed on the official website, but as the crib mattress is marketed as durable and for use by toddlers, we’re going to assume that this means it can support up to at least 35 pounds—which is about the average weight of a three year old. We’ve reached out to Colgate Mattress to ask about this particular bit of information as well as other clarifications, and will update this section if they reply. How Does the Colgate Eco Classica III Crib Mattress Feel? It feels firm—the way it’s supposed to feel if it’s going to be used by an infant. Some reviews we’ve seen have mentioned that the extra firm side was too firm; but that is exactly the point. An infant is not supposed to sleep on a surface that may be too soft and pressure relieving, because that’s a health hazard. The slightly softer, toddler side is still firm but not as much. Again, we’ve seen reviews that note that if it weren’t for the clear markings, they’d never know the difference between the two sides. There’s a lot to like about Colgate Mattress. It’s easy to feel at ease with a company that’s family-owned and family-operated, especially it’s been in the business for more than half a century. That the products are made and handcrafted in the US is also a nice touch. However, it’s really the fact that the Colgate Mattress product line is so well-developed and well-populated that does the job of convincing us that this company is one to be trusted. Yes, some of the fine details may be missing from the official website and the press releases—the FAQ leaves a lot to be desired—but there is a lot of information on the company’s sustainability practices and its history. Coupled with the numerous products that are all infant- and toddler-focused, it has us believing that Colgate Mattress is a company that truly cares about its customers and the quality of the products that they provide. That said, we have looked at customer feedback and product reviews online extensively, and while there is an overwhelming amount of positive feedback regarding the Colgate Eco Classica III, it’s not all good. Negative feedback—complaints about product quality, questions about materials and constructions, and more—seems to be cropping up particular for recent purchases. We’ve seen reports of people buying their second or third Colgate Eco Classica III, and then complaining that they didn’t get the same product at all. The common complaints seem to involve the stitching and the mattress cover fabric, as well as not being able to tell which side is which. How is Colgate Mattress’ Customer Support? Here is where they fail—at least, in our experience. Colgate Mattress offers customer support through a telephone number and an email address. They also have a consistent and very responsive social media presence, which we appreciate. However, it seems that they’re not as quick to respond to email. We had several questions about the Colgate Eco Classica III, and as we do with every product we review, we contacted the brand’s customer support team. As of this current update to the review, they still haven’t replied to us. It’s been eight months since we sent our email. There is a return policy and a 90-day money back guarantee, as well as a limited lifetime warranty. The money-back guarantee offer stands only for orders placed with Colgate directly, though. This is important! If you get a Colgate Eco Classica III from another retailer, their respective return policy is the one that will be followed. There’s also a replacement policy for products damaged during shipping, but there is a clear procedure you need to follow to avail of this. Check the official website for more information. About the warranty: The conditions are typical. It’s non-transferable and only honors the original owner with proof of purchase. It covers only workmanship or material defects, and not regular wear and tear. This means that you can’t use the warranty should the mattress cover get stained or the mattress get warped due to undue physical strain or abuse. The Colgate Eco Classica III is available on the official website for $219.99 and on Amazon for $169.99, as of this writing. Free standard shipping is offered to the 48 contiguous US states by the brand’s official online store. Expect the product to arrive within a week. This price point is about average for high quality, innovative crib mattresses; but a little but too much, in our opinion, for a product without a trial period and without a truly unique aspect to its design. Visit Amazon & Find Colgate Eco Classica III Deals Now! This product is obviously well-loved and well-reviewed, but we admit that we’re a little mystified now that we’ve dug deeper to find out why. There is nothing wrong with it. It’s not marketed as organic—just “eco-friendlier”—so technically it’s not a big deal if it’s not exactly completely biodegradable or devoid of synthetic material. Even in negative reviews, we didn’t find any mentions of allergic reactions or off-gassing complaints. The mattress cover does its job well, in that it is waterproof enough to prevent fluid from getting into the foam component. We didn’t find any complaints about heat retention or breathability problems, either. Here’s the thing, though: For a product that’s basically a foam mattress with a waterproof cover, the price point is just a little bit too high, even for being dual-sided. However, it can be worth it if your child does use it until the end of their toddler years—especially if you also use other compatible products from Colgate Mattress.